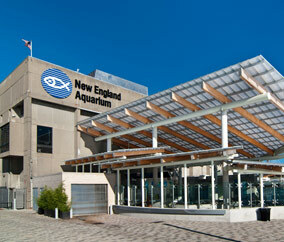 The New England Aquarium is a global leader in ocean exploration and marine conservation. In addition to three species of sea turtle in the new interactive Turtle Rescue Team exhibit, there are thousands of other aquatic animals to visit at the Aquarium. Don't miss the fearsome lionfish, the delicate leafy seadragons, the Northern fur seals, the Atlantic harbor seals, and the California sea lions in action. Complete your visit with awe-inspiring 3D films in the Simons IMAX Theater.